Rapamycin, a drug approved by the FDA to stop tissue rejection after organ transplants, has been found to reverse the brain dysfunction caused by a genetic disease - tuberous sclerosis complex (TSC). "This is the first study to demonstrate that the drug rapamycin can repair learning deficits related to a genetic mutation that causes autism in humans. The same mutation in animals produces learning disorders, which we were able to eliminate in adult mice," explained principal investigator Dr. Alcino Silva, professor of neurobiology and psychiatry at the David Geffen School of Medicine at UCLA. "Our work and other recent studies suggest that some forms of mental retardation can be reversed, even in the adult brain." "These findings challenge the theory that abnormal brain development is to blame for mental impairment in tuberous sclerosis," added first author Dan Ehninger, postgraduate researcher in neurobiology. "Our research shows that the disease's learning problems are caused by reversible changes in brain function -- not by permanent damage to the developing brain." TSC often causes severe mental retardation; half of all TSC patients also suffer from autism and epilepsy. The disorder afflicts about one in 6,000 people - twice as common as Huntington's or Lou Gehrig's disease. Silva and Ehninger studied mice bred with TSC and verified that the animals suffered from the same severe learning difficulties as human patients. Next, the UCLA team traced the source of the learning problems to biochemical changes sparking abnormal function of the hippocampus, a brain structure that plays a key role in memory. "Memory is as much about discarding trivial details as it is about storing useful information," said Silva, a member of the UCLA Department of Psychology and UCLA Brain Research Institute. "Our findings suggest that mice with the mutation cannot distinguish between important and unimportant data. We suspect that their brains are filled with meaningless noise that interferes with learning." "After only three days of treatment, the TSC mice learned as quickly as the healthy mice," said Ehninger. "The rapamycin corrected the biochemistry, reversed the learning deficits and restored normal hippocampal function, allowing the mice's brains to store memories properly." Science fiction fans may be reminded of the technique used in the Hugo award-winning short story Flowers for Algernon, published in 1959 in The Magazine of Fantasy and Science Fiction by Daniel Keyes. In the story, a lab mouse has undergone a new kind of surgery to increase intelligence. 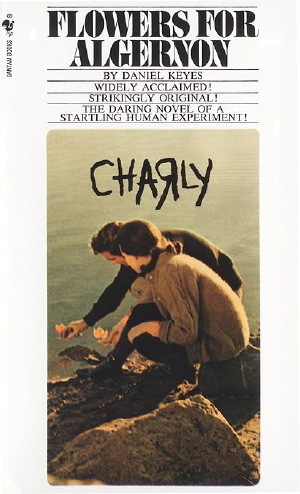 The first human test subject, a mildly retarded man named Charlie, writes a set of brief diary entries that form the story. Via EurekAlert! ; thanks to Moira for the tip and the reference.